Brunner coal mine – holiday destination? 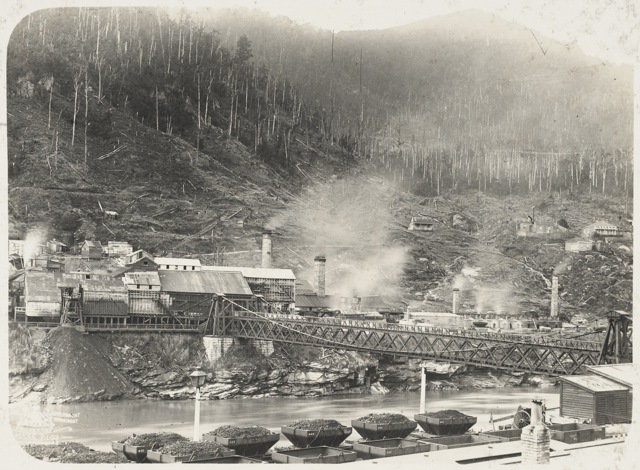 View of the coalmining town of Brunner, showing the bridge and the mine. Ref: PA1-o-498-36. Alexander Turnbull Library. This is a photo of the mining settlement of Brunner, perched on the side of the Grey River, on the West Coast of the South Island. The photo is interesting in itself. The mine can be seen in the middle ground, with houses on the deforested flanks of the hills behind the mine. Coal ready for transport by rail can be seen in the foreground. Tailings can also be seen spilling into the river. It is also of historical interest. The Brunner Mine became the site of New Zealand’s worst mining disaster, when in March 1896 an explosion deep in the mine killed all 65 miners inside. It is likely that the explosion was caused by a pocket of methane gas being accidentally ignited. 33 of the victims are buried in a mass grave at the nearby Stillwater Cemetery. However, what I find most interesting about this photograph is its provenance. It was taken for the New Zealand Tourist and Publicity Department. It is hard to imagine today a coal mine or industrial plant being photographed to promote New Zealand as a holiday destination, but perhaps it was to promote the country as a place of great potential, worthy of overseas investment? It is fascinating to imagine the thinking behind the photograph at the time. Ironically, the site is today a popular destination for tourists, administered by the Department of Conservation, featuring walks, interpretative signs and displays. See Brunner Mine Site Walk. It’s great to be provided with these little packages of our history which otherwise I would never know about. Thank you.